Tired of accidentally closing your StackOverflow tabs again?! 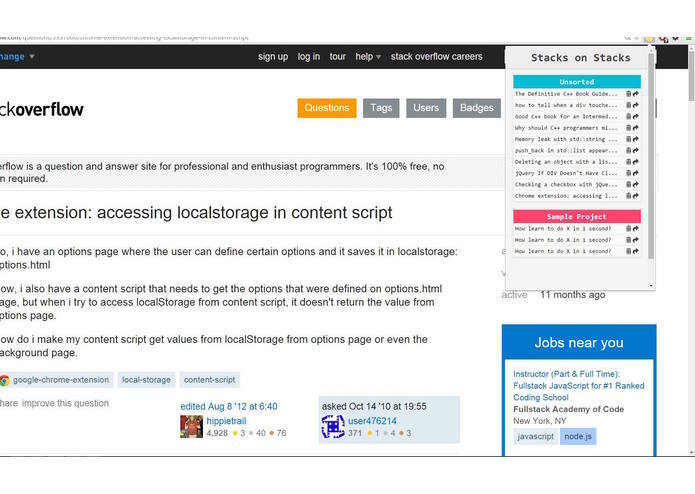 Keep your StackOverflow tabs straight and easy to get to with Stacks on Stacks Chrome extension. Don't worry if you shut your computer off, your tabs will still be here waiting for you when you come back. Go ahead and close them. As Computer Science students at NYU, we practically live on StackOverflow day to day. We rely on it. But, whenever we work on anything, we find ourselves getting swamped with at least 30 tabs open, and half of them are StackOverflow questions. We thought to ourselves, how can we make our lives easier with minimal work? Our solution is to build an extension that we desperately need when we code while minimizing actual hacking hours worked on the extension.